Being healthier and happier at flyweight appeals to Joanne Calderwood and along with some advice from the UFC Performance Institute, she’s no longer planning to return to strawweight. Joanne Calderwood always wanted to be UFC strawweight champion and that may have been the itch she shouldn’t couldn’t scratch when asked about returning to her old stomping grounds. 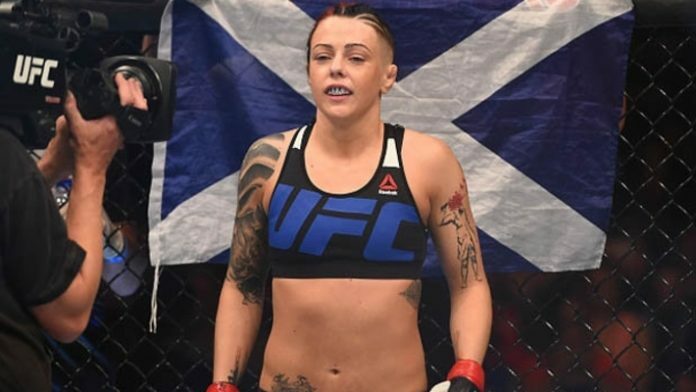 The Scottish contender joined the UFC as a 115-pound competitor on ‘The Ultimate Fighter’ season that helped crown the first ever strawweight champion. Lately, Calderwood has been enjoying her life as a flyweight where she’s currently 2-0 in the UFC with a knockout and a submission on her resume. No longer torturing her body to get down to 115 pounds was a welcome change and working with the UFC Performance Institute has given Calderwood all the tools she needs to know she belongs at flyweight. Still, Calderwood said ahead of her last fight that she still believed a return to strawweight could happen in the future but it appears those plans have been abandoned. Speaking just ahead of her return to action at UFC Fight Night in Brooklyn on Saturday night, Calderwood says it was probably her desire to be strawweight champion that drove that need to return to 115 pounds but the reality is that just wouldn’t be good for her even if she could make the cut. “I brought this up at the [Performance Institute] and they were like ‘no way’,” Calderwood said about returning to strawweight. “They’ve done all the tests and stuff and I respect their decision. I guess it was kind of that a little bit of the ego in me. I had a good career at strawweight but I started looking at the division and I know I could make that [weight] but I have to start making smarter decisions for my career and my lifestyle. If Calderwood can get past UFC newcomer Ariane Lipski this weekend, she would move to 3-0 in the division at a time when contenders are on short supply in the flyweight division. Calderwood has long dreamed of becoming a champion in the UFC and she feels that a showcase win this weekend on ESPN could move her that much closer to an opportunity to face 125-ound queen Valentina Shevchenko. “I think if you go out there and put on a good performance for the fans and for the UFC then you jump up the ladder or jump into the top five or even be called the next contender for the championship. That’s just the way the game goes,” Calderwood said. What do you think of a potential fight between Joanne Calderwood and Valentina Shevchenko? Sound off in the comments and let us know!